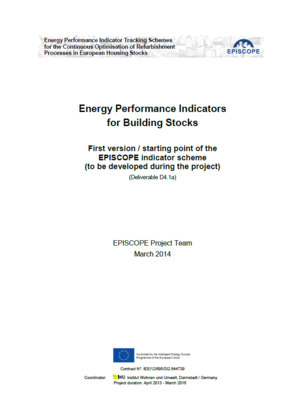 In the EPISCOPE project a scheme of energy performance indicators for building stocks was developed: EPISCOPE_Indicators_FirstConcept.pdf. The indicator scheme makes possible comparisons between different actions of energy performance tracking (within and beyond EPISCOPE). Moreover, it is intended to define a generally applicable set of quantities which – in case of regular update – can deliver the basic information which is necessary to observe and understand the development of energy performance in residential building stocks. (1) Monitoring: Reliable and representative data of the building stock have to be collected and updated regularly. Basic information is characterised by monitoring indicators. (2) Scenario analysis: A model of the building stock is established and scenario analysis of possible future development is carried out. Scenario indicators describe basic assumptions and the most important results. 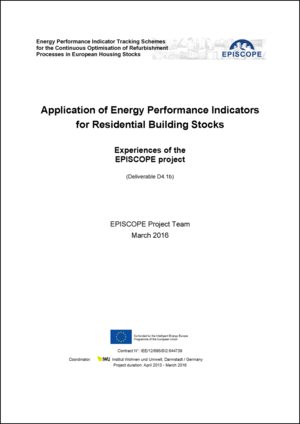 The report on application of energy performance indicators provides an overview of the basic ideas and the concrete approaches which were followed in the EPISCOPE project: EPISCOPE_Indicators_ConceptAndExperiences.pdf. The concepts of “Summary Indicators” and “Average Buildings” are introduced, which had not yet been elaborated in the former report (see above). The summary indicators form a simplified and condensed indicator scheme aiming to provide basic information of the scenarios at a glance and also easy to understand for “non-experts” – that means an audience which cannot get into details of the applied models, parameters and indicators. The average buildings scheme is a special and more elaborated version of the structural scenario state indicators. Here the complete building stock is divided in a manageable number of subsets, each of which is represented by a synthetical building. These buildings represent average values of the building stocks’ subsets and can be used for energy balance calculations and simplified model formation of building stocks.